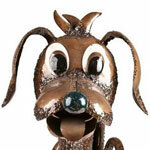 We also sell a silver Fido The Dog. He comes complete with wide flat feet, long floppy ears, a big blue nose and a face you’ll fall in love with and he’ll frame your favourite picture perfectly. The designs are the brainchild of an Australian jewellery maker and they’re all highly detailed with great aesthetic appeal.